The Percula Clownfish with it's vivid colouration and amazing personality along with it's hardiness is an all time favourite amongst reef fishes. These are tank bred specimens therefore immune to most clownfish diseases and a lot easier to care for and are extremely hardy. 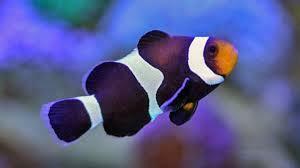 They will happily feed on most prepared foods such as flake, mysis, brine etc. These fish can be kept in pairs and in groups in the larger aquariums of 80 gallons or more , they will associate with Heteractis magnifica and Stichodactyla anemones in the wild but will be very happy without a host anemone in captivity.